waoh! wonderful words. Never read a glorification like that. Eagerly waiting to get a copy of this book. Perfectly described! The “Journey Home” book is such a book that once you begin to read it you cannot put it down for anything else. Really true. This book is really amazing. Thank you so much for your review which just goes to show how appeling Radhanath Swami’s book is. The review by Pam Binder has really struck me!!! Very nice comment amd surely it echoes the sentiments of millions across the world. Interesting review.. I think I’ll reread the book after seeing this. perfect description of the book. Truly an amazing book, even when read more than once. I had exactly the same experience as Pam Binder has described in her review of the book ‘Journey Home’. The book is indeed so captivating & refreshes our consciousness & by just reading it, one can feel the purity in one’s mind. Such is the power of this book. Thank you Radhanath Swami for sharing the details of your inspiring spiritual journey through your amazing autobiography. 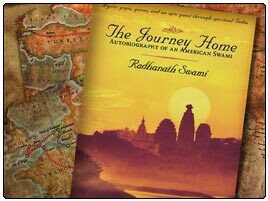 These are very true and inspiring comments for one who has not read the “Journey Home” book written by Radhanath swami. Very true! You want this book to go on and on, so one can immerse oneelf in the amazing adventures of Radhanath swami’s great quest for spirituality! very interesting comments. Feel like grabbing a copy of this book. Even I was thinking on the same lines. I am reading this book and finding myself in a similar situation but your words have presented these feelings in a very beautiful way. To testify Pam binders words, please read the book. Its amazing.. Thank you for your nice review. I had the same experience while reading it.